When we posted a picture of this Grinch quilt to our Facebook and Instagram pages in October, it got LOTS of response. In fact, it’s been one of our most popular posts of the year. Comments ranged from praise and amazement to questions about the panel and design. 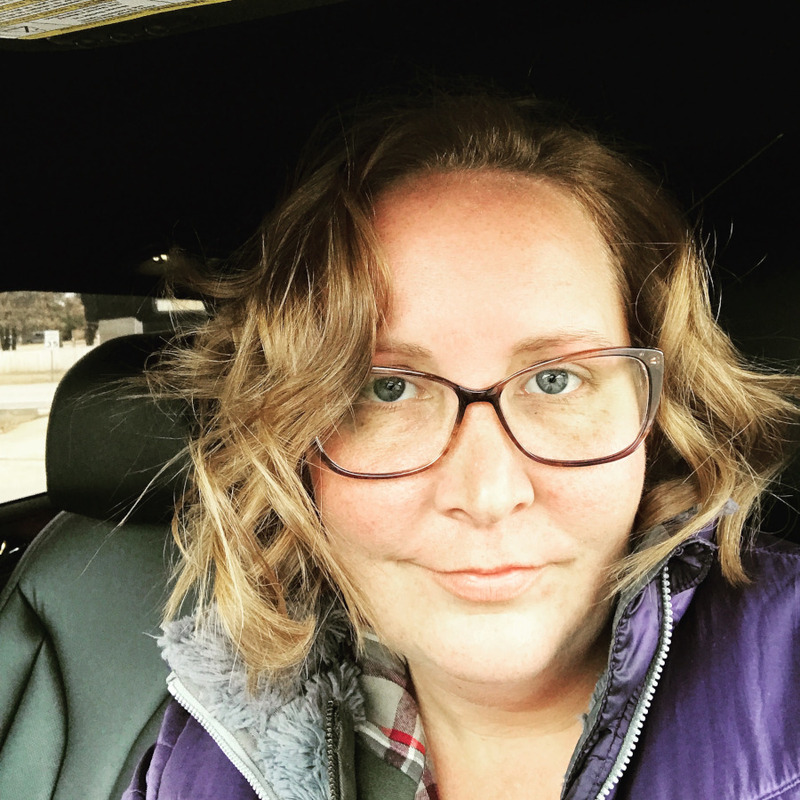 The quilter on the receiving end of those compliments and ensuing messages was Megan Lundgren, the owner of Red Cow Quilts in Minco, Oklahoma. We decided to give her a call to learn more about “The Grinch” quilt and her story as a quilter. 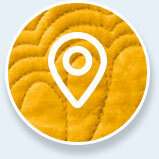 Tell us about how you got into quilting. 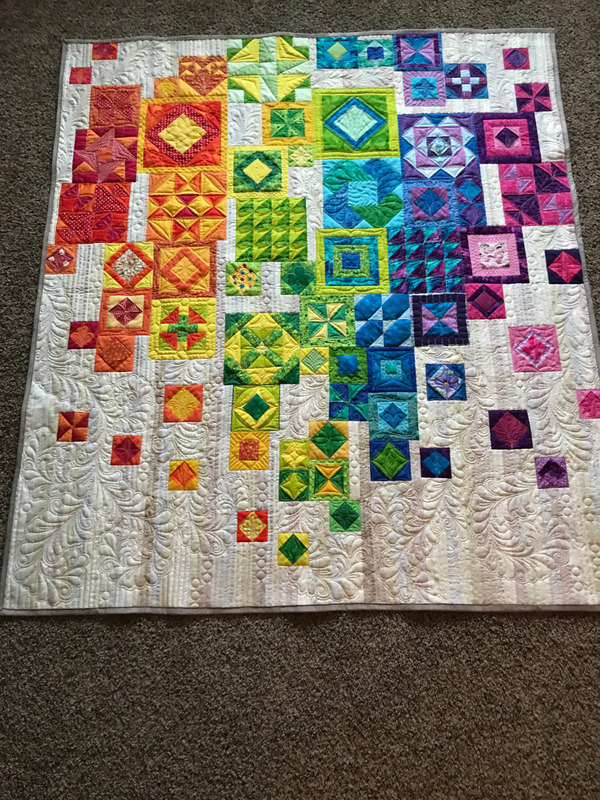 I started quilting five years ago when my husband and I were dating. I decided I wanted to make his son (now my stepson) a quilt. I knew how to sew and although I wasn’t a great seamstress, I could follow directions pretty well and decided to give quilting a try. The folks at my local quilt shop were really amazing and helped me pick out a beginner pattern. What I realized when I was working on that quilt is that I really loved the quilting process. I left my day job in July to make quilting my focus. I’m a licensed counselor and had worked in the mental health field, so I’ve always been a big proponent of self-care. Quilting became that creative outlet for me. I was hooked! Your progression from hobby quilter to professional quilter happened pretty quickly. 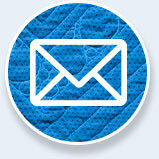 Tell us about how you decided to start Red Cow Quilting. I’m at the age where many of my friends are getting married and having babies – so I always had a list of people to make quilts for. I was also doing charity quilts, and at some point people started telling me that I should be offering my quilting as a service. I made the leap about a year ago. 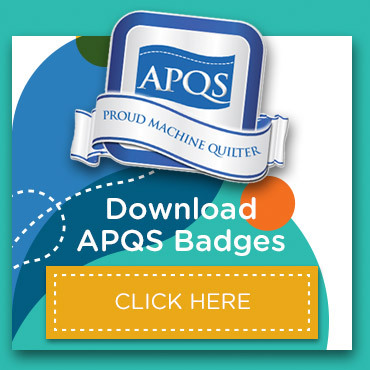 I test drove a few quilting machines and ended up purchasing an APQS Lucey quilting machine from Brenda at APQS Oklahoma | Red Barn Quilting. It was right before Christmas, so I went to my local quilt shop and handed out flyers that said I would help complete last-minute Christmas quilts. That angle worked really well for me. Why did you decide to switch from your domestic machine to a longarm? I really wanted to do more with the quilts in regard to custom quilting – and my domestic machine was making it challenging to plan out the quilt and get the designs to specific parts of the quilt top. I was also doing a lot of larger quilts, and constantly wrestling with the quilts to fit them into the domestic was hard. I love my Lucey and now that I’m busier I actually regret not getting a Millie or a Millie30. How did you settle on the design of “The Grinch” quilt? 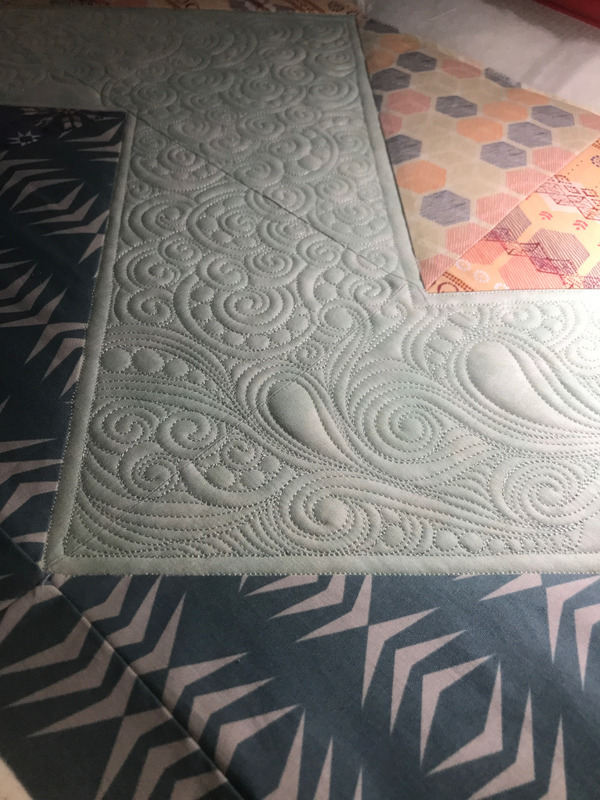 All of the quilting I’m doing right now is free motion custom quilting, and I had done quite a few other fabric panels. But I had to sit with this one for a while. I really wanted to do something that looked whimsical and fun. I wanted it to feel like the movie. Plus, it looked like it was outside so I wanted to incorporate wind and snowflakes. That’s how I ended up with the swirly McTavishing design. 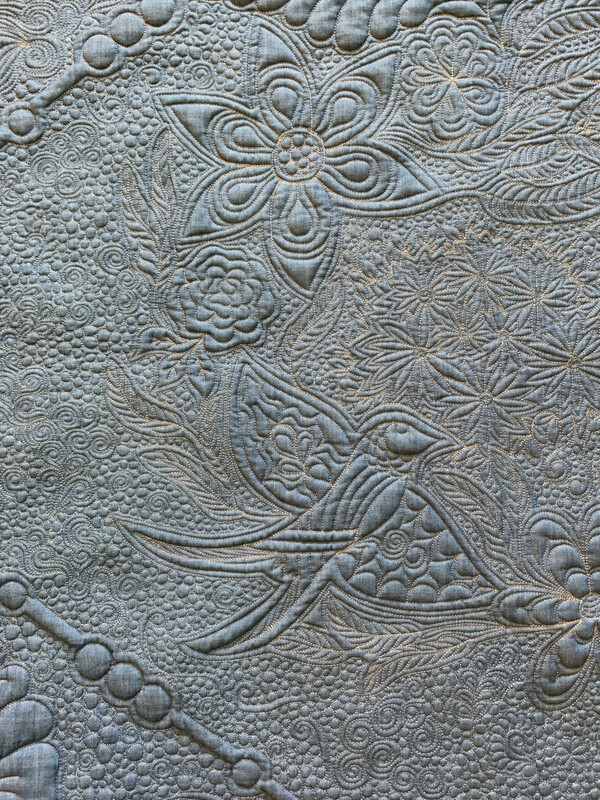 It gives the quilt texture but still lets the panel be the focus. When the APQS post with my quilt went up, I started getting all these messages. Lots of people wanted to know what the panel was or if they could buy the quilt. I’m actually doing four more of these as a result. 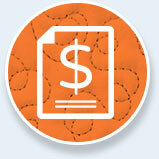 What advice do you have for quilters who may be thinking about starting their own business? Start small! If people have been giving you feedback that your work is good enough for paying customers, then it probably is. 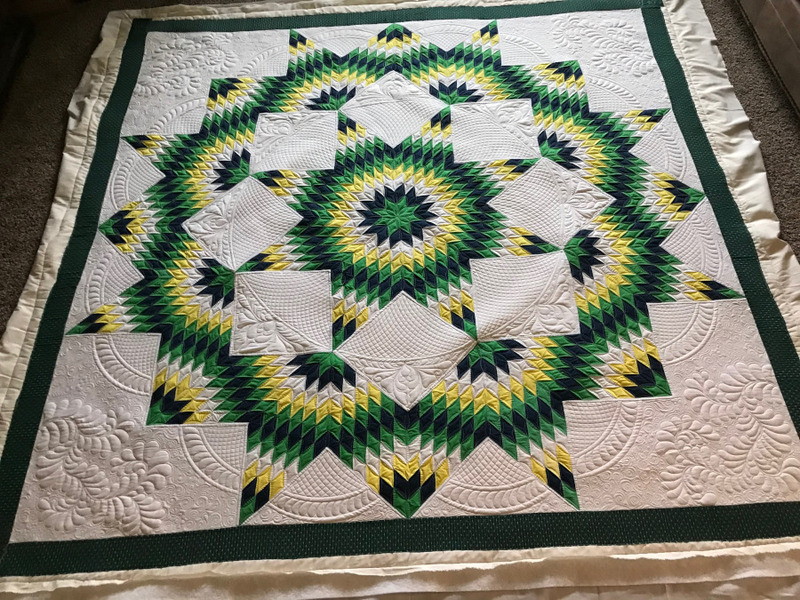 Before you make the leap, try to get your hands on some vintage quilt tops – I find that those are sometimes the most challenging. If you can tackle those confidently, you’ll be in good shape. I would also recommend investing in classes and finding mentors you can lean on – whether it’s business questions or quilting questions. When you’re seeking out mentors, don’t expect one person to have all the answers…find multiple people whose strengths are different. Congratulations on your 1st full year in business, Megan. 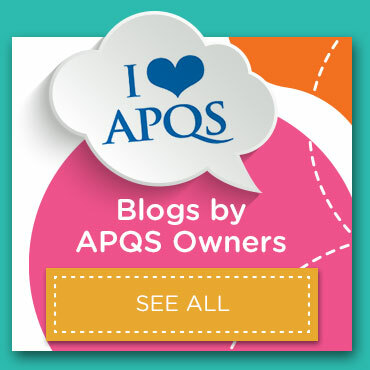 Thanks for being part of the APQS family! You can find Megan on Facebook and on Instagram. If you’ve recently completed a quilt that you’d like to share with the APQS social media team, please fill out the form on this page. Graduation parties – they’re a staple this time of year and are a sign that summer is just around the corner! If you’re looking for a gift for your favorite graduate, consider making a T-shirt quilt to capture their best memories. Learn how to quilt the "Candle Wick" filler from Angela Huffman, APQS dealer and educator. The filler looks a little complicated but when Angela breaks it down you'll see it's got some basic shapes that are easy to complete. In this APQS Video Tutorial APQS Dealer and Educator Angela Huffman shares a sweet little border design we call "Daffodils" that is perfect for your next baby quilt! Your imagination will run wild when you see all the astounding quilts that can be created with just a simple half-square triangle block! Brenda Shreve of APQS Oklahoma/Red Barn Quilting has shared this free pattern that is bursting with ideas.